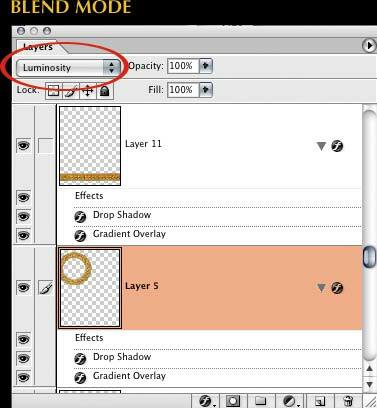 If you’re not familiar with Photoshop’s Layer Styles, now’s your chance! 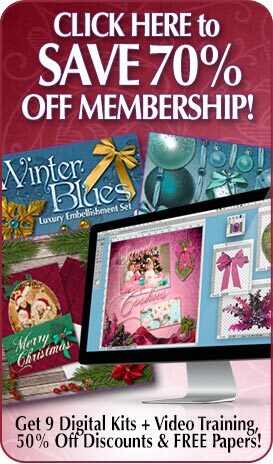 Let’s start with digital scrapbooking tips for using items from my sets with matching papers and backgrounds, such as Word Art and other decorative elements. Photoshop Layer Styles are saved as .asl files. For example, the ones from my “Illuminations” pack are called Illuminations_Old_Gold.asl. To install styles, simply copy the .asl file into your Photoshop Plugins folder (Photoshop > Presets > Layer Styles). They don’t HAVE to go there, but it’s easier if they are all in one spot. To load the Photoshop styles into Photoshop for use, just open your Photoshop Styles palette, then click the small black triangle at the top of the palette and go to Load Styles. Add new or more styles by choosing Append, or replace your current styles completely by choosing Replace Styles. Then navigate to the .asl file stored in your plugins folder. To apply a style, just choose your layer and click one of the styles on the palette to apply it. If your Photoshop styles don’t look quite right when applied, be sure to check that you have applied the style to a layer with no other styles already applied and its Blend Mode set to normal. If you apply a style, but find that it does not look quite right, try right-clicking or control-clicking the layer in the layers palette right over the funky-looking white “f” in the black circle at the end of the layer name. This won’t appear unless you have already applied SOME kind of style. You have to click EXACTLY ON the “f”. Otherwise all it does is open the Photoshop layer styles so you can see them. It should bring up a dropdown menu that lets you choose “Scale Effects” at the bottom. You can then adjust the slider that comes up to “dial in” the amount of the “style” you want applied. It often fixes things when applying Photoshop styles to smaller objects or type so you can still use your favorite styles! NOTE: SOME PHOTOSHOP LAYER STYLES INCLUDED IN MY PACKS DO REQUIRE CHOOSING A BASE COLOR BEFORE YOU APPLY THE STYLE. PLEASE SEE THE README FILE FOR THE PRODUCTS TO CHECK FOR SPECIFIC COLORS. Space permitting, I will usually provide a solid square of the basic color on one of the promos for you to pick up the color from, if needed. Just like adding a drop shadow, you can add additional effects to any layer such as Color Overlay (solid colors), Gradient Overlay (color blends), Satin (brightens or darkens), Pattern Overlay (applies a pattern to the layer), and more. Each of these Photoshop layer styles can be individually set with regard to opacity, blending style, color variation, etc., INDEPENDENTLY of the the overall layer’s Blending Mode for literally 1000’s of effects. 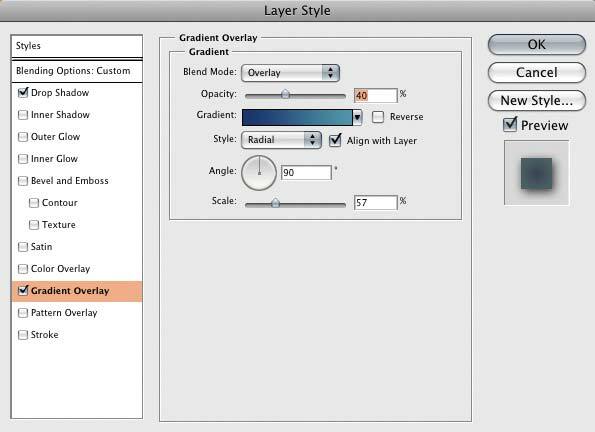 Once you are comfortable working with layer styles, you can begin to build up a library of your own to use again and again. Just save them into your styles folder in Photoshop (Photoshop > Presets > Layer Styles) by using the little arrow at the top of the styles palette while you are on the layer of a style you want to save. To save a whole set of styles, choose the Preset Manager instead, and select the styles you want to save as an .asl file. If you crash and you have not saved your styles, you will probably lose them! So, if you make something you really like, be sure and append it to your styles file or make a separate styles file for whole groups. I tend to keep a styles file like “Zai.asl” filled with the Photoshop styles I use most often.